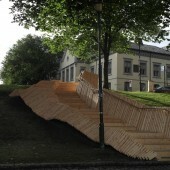 Architecture students from NTNU have designed and built a stairway and exhibition linking together the upper and lower parts of Kjøpmannsgata (Area within the City of Trondheim) .The layered stairway is a symbol of co-operation between Trondheim municipality BLÅ TRÅD, Studio:Beta, Faculty of Architecture and Fine Art and a wave of student engagement. The project was completed in 13 days through a combination of 1:1 testing, concept development and discussions between different parties. The wave-like design concept has been expressed through the transverse lines of the floorboards creating a continuous form down the slope, forming seating and plateau. 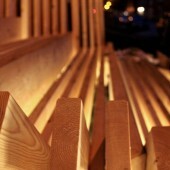 The structure also includes a removable display can be used for all the exhibits to energize the street. 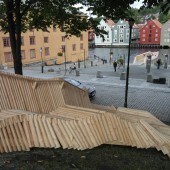 Bølgen was a contribution to the Holzbau Nordic conference in September 2014. Research Question: Can temporary architecture inform the development of our urban spaces and stimulate an otherwise unused public space?